The Frigid-X™ Adjustable Spot Cooler is a low cost and maintenance free system which utilizes a vortex tube to produce cold air at one end. 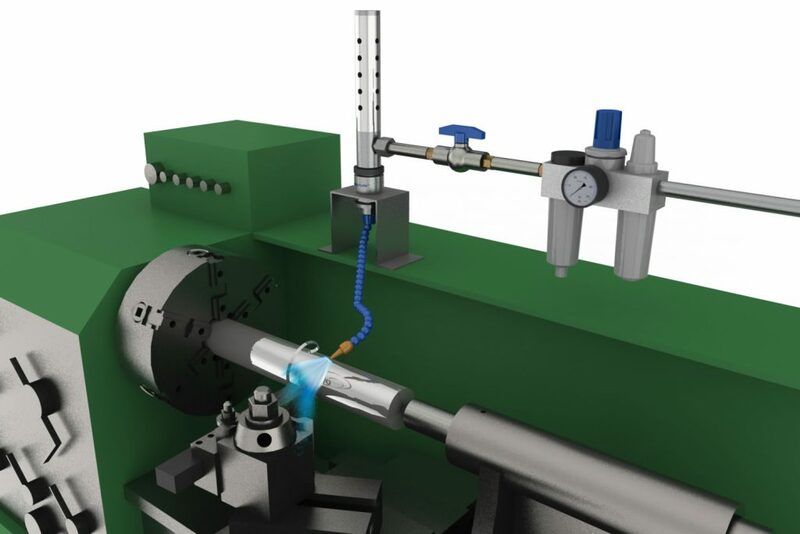 Temperature can be adjusted using a knob at the hot end to set the temperature precisely to your requirements. Temperatures range from approximately minus 30ºF to room temperature and can be easily set with a thermometer. The cooler comes with three brass generators for flow rate adjustment – 15 SCFM (425 SLPM), 25 SCFM (708 SLPM) and 30 SCFM ( 850 SLPM) providing refrigeration up to 2100 BTU/hr (615 Watts). All Metal Parts, Stainless Steel Body, Quiet – Under 70dBA, Tests Show Frigid-X™ Adjustable Spot Cooler is Constantly Quieter Than the Competition! Cold air is directed using the flexible tubing and a magnetic base is standard for portability and easy mounting. Units are available with either a single point hose kit for small surface areas or a dual point hose kit when heat is generated over a larger surface area. The cooler can produce a wide range of airflow and temperature by adjusting the knob at the hot end and changing the various generators supplied. Our Adjustable spot cooler has a 25 SCFM (708 SLPM) generator installed that will produce up to 1,800 Btu/hr. of cooling. If less is required, the 15 SCFM (425 SLPM) generator can deliver 1,100 Btu/hr. Compressed air enters at point (A) into the vortex tube component of the spot cooler. 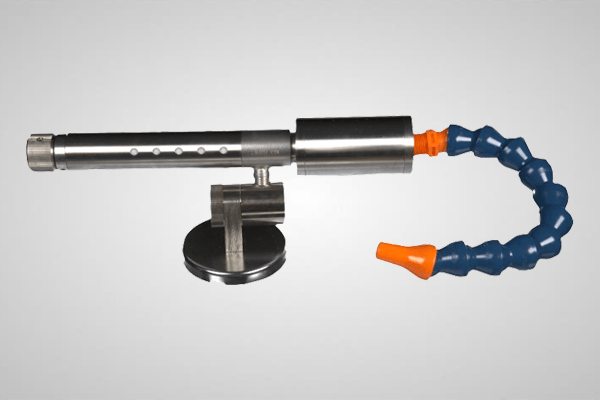 The vortex tube splits the compressed air into a hot (B) and cold (C) stream of air. The hot air from the vortex tube is vented to the atmosphere at point (D) after being muffled to reduce noise. Cold air enters into the muffler (E) and is then distributed through the hose distribution kit (F) and onto the item being cooled. A strong magnet (G) holds the spot cooler in place. The temperature of the cold air is controlled by an adjustable knob.